Portfolio management is as much about picking trends as it is about picking stocks. As managers of Canadian equities, particularly what Leon Frazer defines as “backbone” equities (telecommunications, utilities, pipelines, banks and energy), we need to consider how the backbone of the economy—the Canadian consumer—is faring. 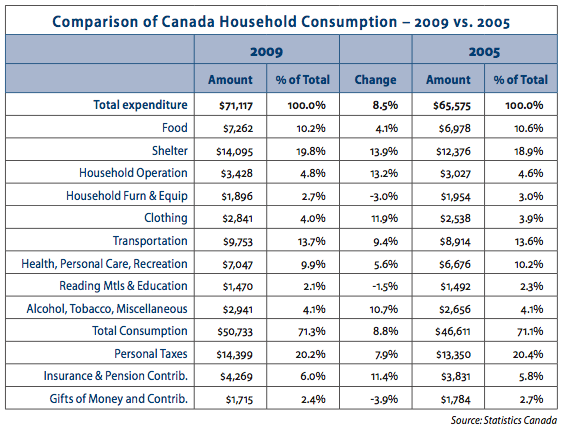 The table below is extracted from a December 2010 Statistics Canada report entitled Spending Patterns in Canada. It shows how Canadians spent their monies in the down-spending year of 2009, and compares those expenditures to those in 2005, a much better year. From a budgeting perspective, you might want to measure how your own expenditures compare!